Hello: My name is Raj Bapna. I was born in Udaipur, Rajasthan. I was an ordinary student in class 10th. Then, the next year, I got 5th rank in Rajasthan Board, NTSE (NCERT) scholarship, and IITJEE 1102 rank, and as a result studied at BITS and IIT, and joined Intel in California. For over 25 years now, I’ve been helping students to study with better memory and concentration. The Mind Machine is not a book or course, but electronic device. It consists of hardware and programs. Programs come on CDs/DVDs and pen drive. You'll see full details below. It works automatically. All you have to do it put on headphones and eye glasses, and run a program. That's it. Scientists have been able to isolate brainwaves of geniuses, monks and yogis, and then were able to create certain technology (which we'll discuss in a second) that allows anybody--no matter how good you already are--to be able to use this technology and have your brainwaves assume the same patterns of such geniuses. So it makes learning easy because you are in a highly advanced state, where you learn quickly and retain better. This new technology is called Mind Machine. When you use this system, you benefit from many unique/proven/patented mind technologies, which would take a book to explain in details. But fortunately, you don't have to understand the details of the 7 mind technologies to benefit from the mind machine. First, it uses various mind technologies to change your brain waves quickly to those best for learning, so your body and mind enter a special state of alertness and deep relaxation that is just right for learning. We call it "learning state". In this state the brain waves on the right side and the left side of your brain tend to move up and down together and this is called "hemispheric synchronization" or "integration of left brain and right brain". This state is the best for studies and learning. You hear a different story in each ear. These stories have powerful beneficial messages as part of the stories. Our mind tries to understand both the stories, but soon realizes it cannot. And in that moment, you feel tremendously relaxed and the messages can reach your subconscious mind and change beliefs. This is the most powerful method of belief change because it is totally effortless. It builds empowering beliefs for you, so you can achieve breakthrough success. It works to overcome limiting beliefs. You can get full details of these mind technologies here. Students need to used only the ALEM programs. We include other programs (such as Stress Buster and Meditations) for use after your eduction is finished and you are in a job or business. You use it 2 times a day. First time is when you sit down to study for the first time. It may be morning, afternoon or evening. You use it for about 7 minutes and then remove the glasses (may continue to use the headphones). Second time is when you go to bed to sleep in night. Most users fall asleep in 6 to 7 minutes and it keeps running for 30 minutes. And, when you become aware in the sleep, remove the glasses and headphones, and go back to sleep. Before ordering I had doubts whether it will work for me or not. I had purchased your book Raj Bapna's Mind Power Study Techniques last year and I found it very helpful during studies especially the Topper's Daily Routine. So I wanted to buy Mind machine too... I decided to take a risk. Also considering CBSE 12th syllabus I felt that Mind machine may help me. And hence I decided to Order it on Onam Holidays(Festival of Kerala). I had problems on memorising some Topics in Physics and Maths. I also had problems on concentrating after long hours of study. Because of this I couldn't study for long hours. I also wished to improve my total personality & be relaxed. In addition I had exam fear so I try to make sure that I didn't leave out anything & even then I will not be satisfied.The difficulty of the syllabus made it worse & I then decided that I should buy the Mind machine. I got the Mind machine 2 weeks before. I opened the packing in the evening & since I was tired after class (from 9.30am till 5.00pm) I decided to use Awake & Energise program. Within 5 Minutes I was very energised. Next day evening I used ALEM 201 before studies,& I decided to study. You may not believe it, but the chapter which I studied (Current Electricity) is still in my mind! And then I understood the power of Mind machine. As my 1st term exams are going on now I use ALEM201 for studying & ALEM205 (Exam Preparation) when I go to sleep. The meditation programs & Om, Namokar are also very relaxing. Now I feel that my study time is the best time. Mind machine will help me prepare for AISSCE ... Thank you for creating such a masterpiece! Of course I will recommend it to students. It is not Mind machine, it is Success Machine. Since it is a new technology, people may have doubts like I had. But it is real. It does change the brainwaves into the desired frequency. I recommend all students to use it & feel the benefits themselves. Can it help a good student become great? I can't wait to complete my first one month with the machine and meet the genius in me. I guess I already have had a glimpse of my side. If you get only 50% or even just 20 to 30% as much benefit as Vinod Kumar, will it help you to prepare better for your exam and improve your success? Deepanjan Neogi, BBA 2015 Passed Out, Kolkata, W.B. I had doubts whether I would receive the Mind Machine from you and whether it would work for me. After reading the reviews and feedback from various sources, finally I decided to buy it. At first, money was really an issue but, later, I was able to convince my father to purchase it. I waited for 2-3 moths and finally I ordered it at the beginning of 2015. There are other players in the market e.g. Proteus, Procyon etc. 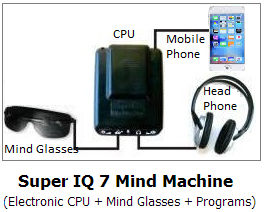 But this Super IQ 7 Mind Machined is developed especially for Indian students. Hence, I decided to purchase it. Before ordering the mind machine, I had many problems. I could not concentrate for a long time in my studies, I was not able to perform in the exams up to the mark etc. After studying for 20-30 mins, I was taking break for another 1-1.5 hours. That's why I was not able to get enough time for self study. Even during the long periods in the college, I was not able to concentrate properly at the end of the period. That's why, I was getting low scores in exams and was performing worse than my competitors. Also my vocabulary was below average. Getting a low percentage in the graduation degree leads to various problems during the job interview as well as admission in the Master's degree. Hence, I was really worried. I have been using the mind machine once or twice a week. It really improved my concentration. I could not score well in my 10th and 10+2 exams. I was far away from getting the top 10 positions in my schools. After using the mind machine, ... I stood 1st in BBA final semester exam and stood 2nd in my BBA course in our college. The mind machine has improved my memory, reduced stress and tensions, increased mental clarity, creativity, problem solving skills, focus & concentration. It also helps me to meditate. I would surely recommend it to students but only to those students who want to be better in their academic life as well as personal life and are really serious about it. Mind machine is not a magic machine with the help of which a student can perform well in studies without any hard and smart work. When someone is using this machine properly, he/she is surely getting an advantage over the non-users. Having the mind machine is just like having a Lamborghini in a car race where others are using Tata Nano. But it does not mean that he/she has already won the race. He/she would have to work hard .. and must have the determination to win the race. The same is true for mind machine as well. It would complement the effort of a student. "Wakes You Up and Energizes You in 3 to 7 Minutes ..."
. . . program called AWAKE AND ENERGIZE wakes you up and energizes you in 3 to 7 minutes . 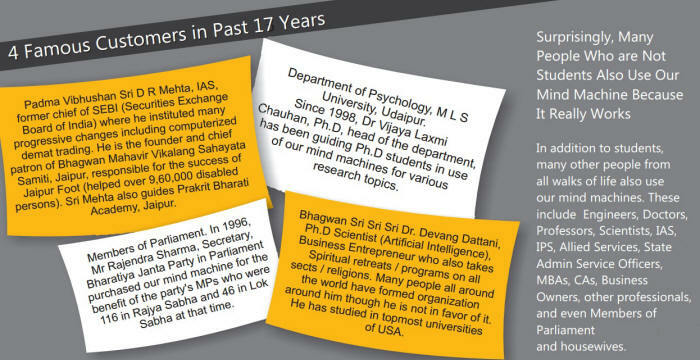 . . poised to be a leader in mind machines world wide for students and executives. In one program to ENTER THE LEARNING STATE, you hear two different magical stories . . . these relax you, change your brain waves toward the desired alpha or theta. First I was having doubt whether to buy the mind machine or not, but when I read about it then I felt I need it to improve my concentration and to improve my marks. I took 2 months to decide. Then I saved my pocket money and bought it. I was unable to concentrate much on studies, and use to get get diverted very fast. Because of it I was getting less marks and I was also having negative attitude. By using mind [machine], my problems regarding concentration, studies were solved, my attitude also improved. It is very good instrument for students who are preparing mainly for competitive exam, it gives you an extra edge in exam. 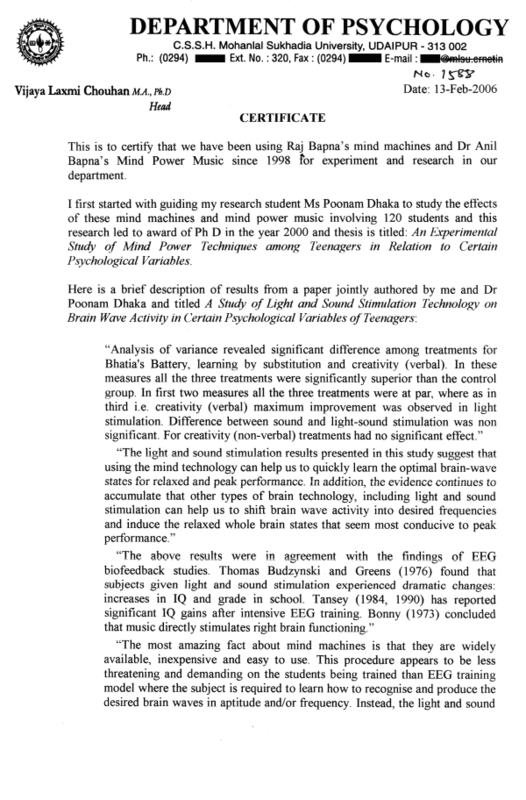 Only mind machine proven by 2 PhDs and recommended by a Department of Psychology after 7 years of research by 5 Ph D scholars with 120 students"
(2) Dr Rudresh Vyas at MTB Arts College, Surat (Gujarat). 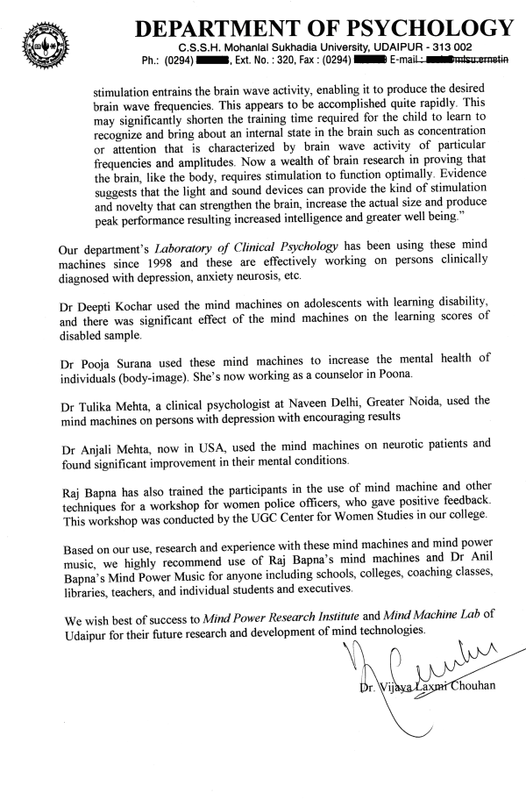 5 Ph D scholars at MLS University, Udaipur (Raj) have researched and used the mind machine with 120 students, and only then, after 7 years of research and practical experience, the Head of the Department of Psychology highly recommended it. "This is to certify that we have been using Raj Bapna's mind machines ... since 1998 for experiment and research in our department. ... Based on our use, research and experience with these mind machines ..., we highly recommend use of Raj Bapna's mind machines ... for anyone including schools, colleges, coaching classes, libraries, teachers, and individual students and executives." Below is the complete 2 page certificate by the head of the Dept of Psychology. Click the images above to zoom in and read. Dr Vyas became interested in our mind machine when he saw a professor of psychology using it for his wife who was suffering a lot of pain due to cancer, and to his surprise she got much pain relief. 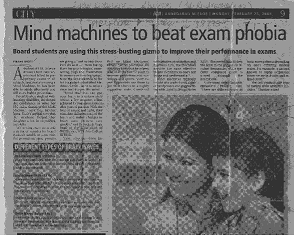 That is when Dr Vyas decided to do PhD to see if the mind machine can help students get more marks in exams. "Mind machines are new for our country, but in Western counties such machines have been in use for more than 60 years mainly to improve academic and sports performance .. The device has been developed with the help of light and sound. They actually stimulate various parts of the brain and change the pattern of brainwaves in a jiffy. Through this process, the device can bring your mind at a level which can only be attained by practicing yoga and meditation which takes a long time." The title of my Ph. D. thesis was "The effects of electro magnetic waves and rhythmic sound on learning behaviour". I conducted comprehensive research using Mind Machine and covering subjects like Neurology, Brain Chemistry, Physiology, and Psychology. Students were divided into two groups, Control and Experiment group. Experiment group was offered 60 sessions of Mind Machine. For my research, I was awarded Ph. D. in 2005 from Sardar Patel University, V.V. Nagar, Anand." at MTB Arts College, Surat. In an interview in DNA. Several thousands of our mind machines are in use since 1993, making them the largest selling mind machine in the world for students. The other famous mind machines in USA are designed for stressed adults. The mind machine has been our bestseller since 1993 when it was first introduced. Since then, thousands of students like you have benefited from it. For years, I got good marks but nothing great up to class 10th which caused me to worry a lot about my future: studies and career. Then I discovered a better way to study, and just one year later, I got 5th rank in Rajasthan Board, NTSE (NCERT) scholarship, and IITJEE 1102 rank, and as a result studied at BITS and IIT, and joined Intel in California... and finally returned to India to help students get more success. I believe you can become your best that you are capable of. And, my mission in life is to help you in that goal. I had used mind machine in Los Angeles "Whole Life Expo" in 1988 and so when I returned to India to help students, I purchased one and brought with me. And, we started building it here in India. The first version called Super IQ was developed during 1992-93. The current version is 7th version, and it is the so advanced, we do not expect to create 8th version for the next 10 years. It was designed for rough use and built to last many many years without any problem. Many famous people are our customers, who order it for themselves and for their children and grandchildren. It is not for persons undergoing psychiatric or psychological treatment who should use the mind machines only under medical supervision. It is not for people suffering from photo-sensitive/ epilepsy related problems because such people should not use the mind machines. I learn from the best to make sure my students get the best. Each of the workshops I attended cost lakhs of Rupees, but there is no other way to learn the latest advances to help you maximize your success. Dr Richard Bandler is the genius behind NLP (Neuro Linguistic Programming). His research has revolutionized the understanding of how to use the mind more effectively. His students include a large number of psychiatrists, psychologists, and other mind/brain experts as well as business people, housewives, students, etc. Well, I ordered Mind power study technique book 6yrs back while preparing for joint entrance, I came to know about mind machines back then from the book but I could not afford it back then. After I got my stipends during internship, I started to make a plan for it & ultimately bought it 6 months back!! I read about the machine, that it could relax one within 15-30 minutes. My duty schedule was going heavy. I wanted to relax quickly & thought that mind machine could serve my purpose.So I ordered it.And also I wanted to study in the active learning state to get maximum benefit. Ok, after buying I first gone through the user guide so that I can use it to fullest benefit. During my exhaustive schedule of internship, I used few of meditation programme along with ALEM 203-205 to have deep relaxation & good sleep. The machine helped me a lot to achieve that.Now,I also use Alem 201 & 202 before starting my reading to achieve the learning state while preparing for post graduate medical entrance. [Would I recommend it?] Yes, very much, for the students who always want to use their ability of doing anything to their highest limit. Mind machine is really one of its kind. Indian students can easily get benefited with the use of this new scientific technology. Sideways I would also recommend highly to use Mind Power Study Technique book, as I got immense help during H.S & in medical school period. I waited for almost a year before I decided to buy it ... now realize I made a wise decision. Before I first heard about this machine, I had been struggling hard for memory retention, concentration and focus. I could not pin my brain on an issue and my mind would stray discreetly and I was off-track. ... The DAPS technology is really helpful in overcoming this problem area. ...I would recommend it to every goal-setter. I would only say that this a wonderful supplement to one's arduous hardwork and worth-giving a chance. Years back, the cost of this technology used to be very high (lakhs of Rupees). If you import from USA, a complete kit / comprehensive package including a mind machine, accelerated learning programs, vocabulary builder program, stress-buster programs, meditation programs, and programs for mind programming, the cost will be over $ 1500 (or Rs 93,000). And in India, you get everything at much lower price. You can order below using online payment or direct deposit of cheque or cash into our SBI account. The discount prices below are guaranteed to be the absolute minimum anybody pays. If the prices are lowered in the next 6 months, you get double the difference. So, you can order confidently that you are paying the absolute lowest minimum price. Books: Vocab Builder in 2-Volumes with 5,871 Words. Plus you get the same vocab as free MP3 programs that are added to the pendrive. Or, send payment to PayPal email rajbapna@gmail.com AND then send email with address, phone, zip. Discounted pricing items-wise details (replacement prices if originals get lost). For TripleCombo: Hardware: Rs 11,758; Books: Rs 2,952. For TripleCombo Deluxe: Hardware: Rs 12,470; Books: Rs 2,740. 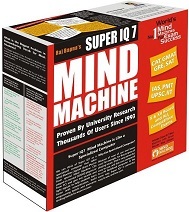 Order Mind Machine because you'll study better. You will be able to study with better memory & sharper concentration. The prices above include everything including postage and GST. You get all programs on the pen drive. For most programs, we also send CD or DVD to keep as backup. Just click the buy now button. Click the BUY NOW button and on the checkout page, you can see the US$ or other currency equivalent. 1-3 days (by courier) and 2-4 days (by Speed Post ). For fastest delivery, we send your package by Blue Dart courier service if available in your PINCODE (check if it delivers to your PINCODE here: www.bluedart.com). When courier is not available (most villages, c/o56APO, etc. ), we send it by Speed Post. After dispatch, we send you email with tracking number. Delivery to J&K and east & north of West Bengal takes longer. Speed Post parcels can get much delayed. Speed Post tracking is less reliable. 3-6 days (by courier). Some countries may have import taxes, that you pay directly to the courier. Phone only (No SMS, No Whatsapp): Temporarily Not Available Time: Mon-Sat 10:00 to 1 and 2 to 5:00 except all public holidays. The headphone is usually a Sony or Philips model. Any headphone shown is for illustrative purpose only.